The largest metropolitan producer of bread, bakery and confectionery products, who has held leading positions in the field of domestic bread baking for over 85 years. Every day we make over 500 tonnes of products and take care to serve our fragrant fresh bread on the table in every Ukrainian family. Provide every family with appetizingly fresh bakery and confectionery of the highest quality! Unique professional experience, highest quality of our products, best skills and traditions in bakery kept by our employees. - A slogan and a rule of "Kyivkhlib"
Our customers are our greatest value. As we cherish our customers, we improve every day, moving ahead with time. Implementing state-of-the-art technologies, ensuring the highest quality of products to meet the needs of our customers, and strengthening positions in foreign markets help us grow steadily and set the pace of the bread-making industry in Ukraine. Being the first industrial producer of bakery products in the city of Kiev, the company “Kyivkhlib” keeps the traditions and holds to the highest quality standards since 1930. We are proud to provide the fourth generation of Kyiv citizens with the opportunity to taste a fragrant bread crust and the unforgettable softness of the freshest muffin. The launch of new production lines, implementation of innovative recipes and introduction of new product mix help us continue our long history of success holding the leading positions in the domestic bakery market. Most of all, we value the confidence of our customers, and traditionally ensure the highest quality of our products. The products of “Kyivkhlib” are made of natural raw materials, without any preservatives and GMOs. Strict compliance with the highest manufacturing standards is ensured by our food safety system and quality management system. At each site of the company, there is a certified technological laboratory to implement control over all stages of the production process, from raw materials acceptance up to storage of finished products. Kyivkhlib is a recognized leader in Ukrainian baking market and a prominent producer of bakery products abroad. The company consists of nine production sites in Kyiv and Kyiv region with daily production of over 500 tonnes of bakery products and 10 tonnes of muffins and cakes. Our product mix covers about 250 items, including various types of bread, dried biscuits, gingerbreads, cookies, rolls, dry rolls, cakes and round loaves made under the trademark of “Kyivkhlib”. The company has its own car fleet and a wide distribution network to deliver fresh bread and flavored bakery just in time to shops in Ukraine and in countries of Europe, Asia and North America. 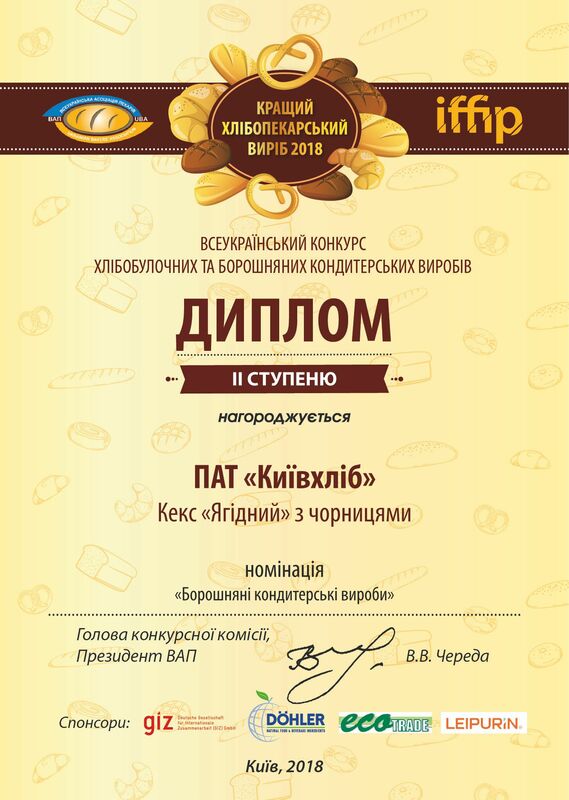 "Best packing design" Bread "Velvet rye"
"Best packing design" Bread "Homemade rye"
"Best packing design" Bread "Finnish"
"Malt rye bread made of wheat and rye flour mixture" Bread "Finnish"
"Malt rye bread made of wheat and rye flour mixture" Bread "Narichansk"
"Malt rye bread made of wheat and rye flour mixture" Bread "Velvet"
"Best packing design" Bread "Velvet"
"Wheat confectionary" Cake "Sofiya Easter Cake"
"Best packing design" Bread "Petrykivka"
"Malt rye bread made of wheat and rye flour mixture" Bread "Petrykivka"
"Malt rye bread made of wheat and rye flour mixture" Bread "Baltic dark with seeds"
"Best packing design" Bread "Family"
"Wheat confectionary" Cookies "Sweet corn"